Jim, a USMC combat veteran, suffered from PTSD after war and was in a really rough state. He frequently fell into trance-like episodes of anxiety and depression. These episodes would keep Jim from engaging in every day tasks, such as getting out of bed, going to the grocery store, or spending time with family. “We were just in a really dark spot in life…” Jim’s wife, Tracy explained. She began looking for help for Jim and eventually reached out to Patriotic Service Dog Foundation to see if Jim might be eligible for a service pup. Soon Jim met a perky, adorable, intelligent pup named Howie and everything changed for him and his family. Jim and Tracy began the process and were soon invited to come by to meet some service dogs. At first Tracy was nervous that it would be difficult for Jim to choose a dog that would become a part of their family. However, as soon as Howie came out, Jim immediately became emotional – the bond was instantaneous. Tracy was stunned and relieved. Both were thrilled. It took a week to solidify the pairing. In the meanwhile, Jim frequently visited Howie. 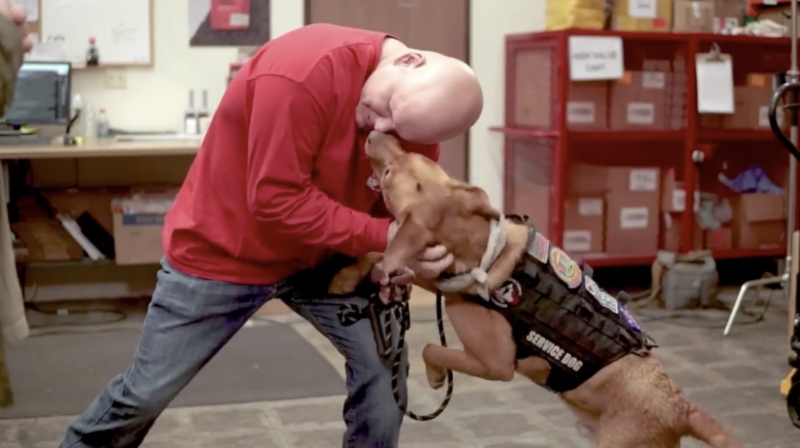 Howie would have cost $30,000 total for all expenses and training, but Jim and Tracy did not have to pay a penny due to donations from kind, caring strangers to Patriotic Service Dog Foundation. 8 week old puppies begin training up until 1 year old at which point they are paired with a Veteran to tailor the training to the specific needs of the Veteran, whether it be to help brace a Veteran who has a disability or to snap a Veteran out of an episode. Howie is trained for pattern interrupt, which is a technique used in behavioral psychology to identify, interrupt, and change thought patterns and behaviors. He will kiss Jim when he shows his own specific pattern – or signs of falling into an episode. Howie’s kisses help Jim quickly snap out of his episodes, which are much rarer now. Jim can simply look at Howie now and feel calm. He brings a sense of peace with just his presence. Howie has become a very important member of their family. “I got my husband back,” says Tracy. When you buy one of our Pets & Vets products, we send a donation to GreaterGood.org, our non-profit partner. GreaterGood.org allocates the funds into grants for service dog training organizations, like Patriotic Service Dog Foundation.